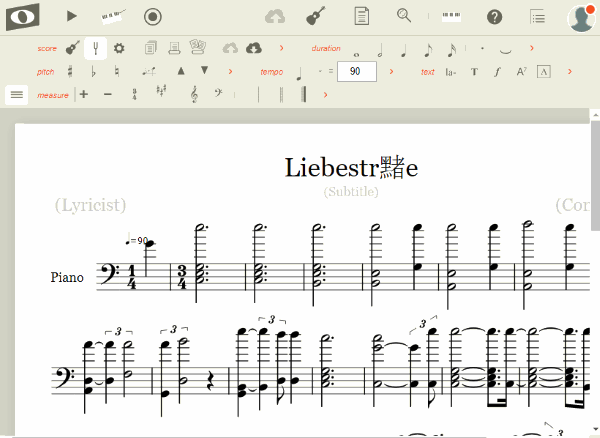 In this post, you will learn about 2 free online sheet music editor. These websites allow you to easily edit your existing sheet music on an intuitive notion editor. They let you import sheet music of the standard formats which are MusicXML and MIDI file. After that, you can edit the notes on the sheet, as new notations, and more. They also let you add other elements such as Ornaments, Articulations, Measures, Text, Dynamics, etc. You will also find the options to change tempo, speed, and import external audio file to play in sync with the sheet music. When you’re done with editing the sheet music, you can use the built-in sheet music player to listen to the changes you have made. You can also export the sheet music as different files like PDF, MIDI, MusicXML, WAV, etc. 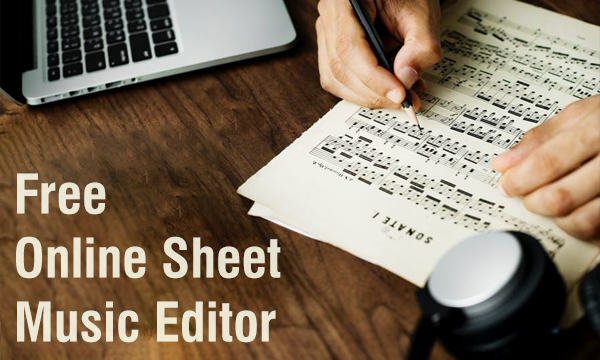 There are many software available for editing sheet music, but if you’re looking for online solutions, then the websites explained in this post can help. Now, let us talk about these online sheet music editors. Flat.io is one of the best free online sheet music editor which you can use to edit your sheet music. It allows you to import the standard MusicXML and MIDI file to the notation editor and then make changes to the music score as you desire. You can edit existing notes, add new notes like Flat, Sharp, Whole, Half, Natural, Thirty Second Note, Sixty-Fourth, Rest, Dotted, etc. It also lets you add Acciaccatura, Grace Note, Octave Shift, and Tuplet to the sheet music. You can manually select any position you want in the sheet to add these notes by clicking on them. Articulation: This option lets you add Staccato, Tenuto, Martellato, Marcato, Fermata, Slurs, Fingerings, Breadth Mark, and more. Ornament: Using this option, you can add elements like Trill, Tremolo, Arpeggio, Mordent, Turn, etc. Dynamic: It will let you add Crescendo, Pianississimo, Piano, Forte, Fortepiano, Pedal, SForzando, and more. Measure: This option allows you to add/remove Measures, Clefs, Time & Key Signature, Repeats, and so on. Text: Using this option, you can add Lyrics, Chords, and Annotations to the sheet music. 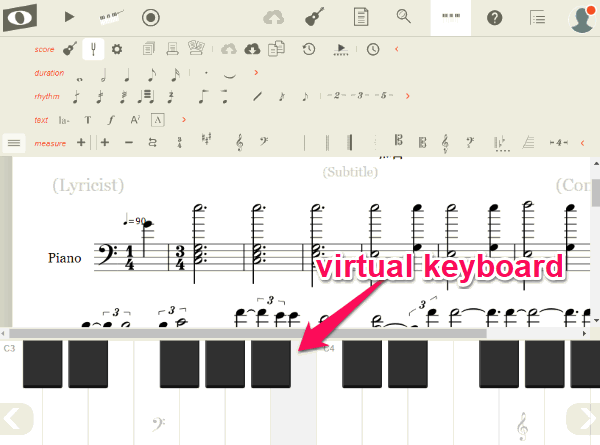 You can also enable a virtual keyboard on the editor to easily add notes to the sheet music. It allows you to edit sheet music for more than 100 instruments including Guitar, Banjo, Piano, Violin, Contrabass, and so on. You can manually add the instrument for which you want to edit the music notations. One of the unique features of this online sheet music editor is that you can invite others for collaboration in real-time. There is no limit on the number of users whom you can invite as collaborators. When you’re done with editing your sheet music, you can export them as PDF, MIDI, MusicXML, MP3, and WAV files. It also lets you play the sheet music directly on the website and also synchronize with external music files. Do note that the free version has a limit of up to 15 music scores or sheet music which you can create or edit. NoteFlight is another free online sheet music editor that allows you to edit sheet music with ease. Similar to “Flat.io”, this one also lets you import the standard sheet music formats i.e. MIDI and MusicXML for editing. You can open any of these files on the simple sheet music editor and start editing the notations. While importing, you can apply the quantization as auto, 32nd, 16th, 8th, quarter, or half. 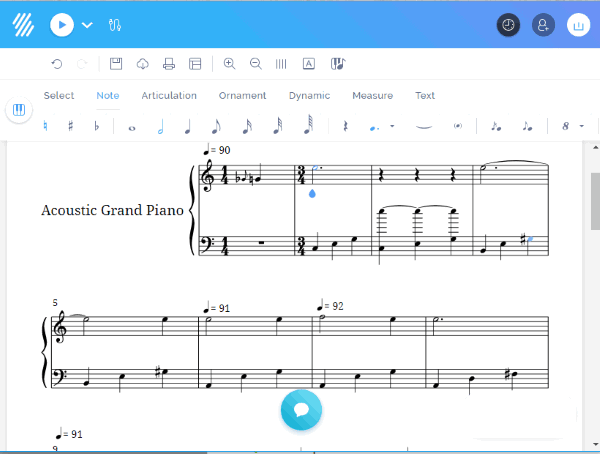 This sheet music editor also lets you edit and add new notes. You can add notes from categories like Duration, Rhythm, Pitch, Tempo, etc. Some of the notes which you can add include Sharp, Flat, Rhythm Dot, Tie, Duplet, Triplet, etc. It allows you to choose any position you want and then easily add these notes. Dynamics: In this category, you will find elements like Diminuendo, Crescendo, Let Vibrate, Pedal Down, and more. Measure: This will let you add Measures, Time Signature, Key Signature, Clef, Barlines, etc. to the sheet music. Text: This category exhibits various elements including Lyrics, Rehearsal Letter, Annotation, Chords, and so on. Ornament: Here you will find Trill, Glissando, Arpeggio, Mordent, Turn, and more elements for the sheet music. Articulation: It let you add Slur, Accent, Staccato, Tenuto, Down Bow, Up Bow, etc. There are other categories which let you add lines, tabs, repeats, and much more. 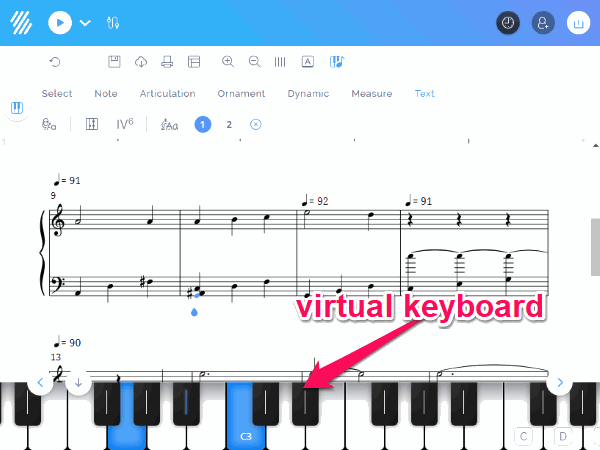 This online sheet music editor also comes with a virtual keyboard that can help you add notes to the sheet music with ease. This editor also supports tons of music instruments for which you can edit sheet music. Some of the supported instruments are Piano, Drums, Flute, Bassoon, Cello, and so on. One of the unique features of this sheet music editor is “Version Controls”. This allows you to see all the versions of the same sheet music, compare them restore, etc. It also lets you connect with music composers, communities, etc. and get assistance on editing sheet music. After you have completed editing the sheet music, you can directly listen to it using the built-in sheet music player. It lets you export them as PDF, MusicXML, MIDI, WAV, and MP3. Similar to “Flat.io”, this one also lets you import external music and sync with the sheet music playback. This sheet music editor also has some limitations in the free version like you can create or edit only 10 music scores. So, these are a couple of online sheet music editor which makes it very easy for you to edit your sheet music. They exhibit almost all the editing tools required to create amazing sheet music. You can even listen to the changes you have made to the sheet music and export the result as printable PDF, or audio file. Go ahead and start using them for free.